Lately it seems that everywhere you look contemporary Israeli choreographers are presenting new works with major dance companies. 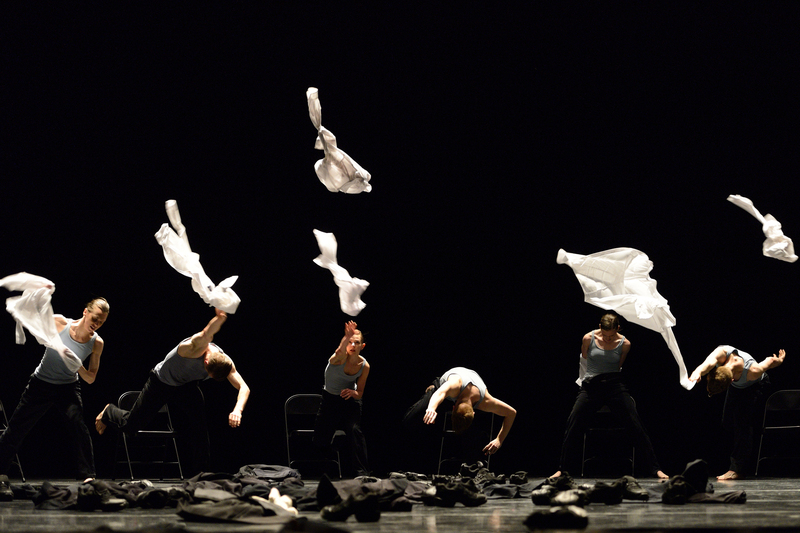 Ballet BC is no exception as they presented a new work by Emanuel Gat, Lock, as well as a compilation piece, Minus 16, by the famed “Gaga” innovator, Ohad Naharin. Also on the bill was a piece by artistic director Emily Molnar that was created for a National Arts Centre commission of new Canadian ballet and music creations called ENCOUNT3RS. Keep Driving, I’m Dreaming had its premiere in Ottawa in April. In Lock, sixteen dancers stood along each side of the stage. In complete silence two of them emerged to meet in the middle and moved slowly, as if they were stick figures, all right angles and straight limbs. Gradually more dancers stepped out of their lines to join in, and pairs moved slowly around the stage. There was an ominous tone as things felt scattered and incoherent. The piece gained some excitement when the music picked up speed and the dancers became a chaotic swarm, but the loud discordant sounds were unpleasant and the meaning of one dancer wearing green pants while the others were in grey was not clear. After a sudden blackout the menagerie of unrelated pairs of dancers created a frenzied cacophony of movement that seemed as though it could have represented the green-trousered protagonist’s consciousness. Or, it could have been meaningless. In between Israeli choreographers, Molnar’s NAC commission, Keep Driving, I’m Dreaming featured eight dancers in a fast-paced piece that had them constantly taking turns moving on and off stage. There was an abundance of running. Dancers running on, off, and around the stage, which created a sense of urgency and unrest, but the cause was unknown. The fantastical music created an atmospheric soundscape while the dancers moved viscerally, although repetitively. It would have been nice to see some dancers on stage at the same time instead of always running on and off. The narrative arc seemed slow to build, and the dancers’ dreamy world seemed to be repeating in loops as they never lingered on a movement or paused for a thought. Finally they were all on stage together for a strong ending that had them running and jumping forward only to be pulled back again in a never-ending cycle. Based on excerpts from three of his previous works (Zachacha, Anaphaza, and Mabul), Naharin’s Minus 16 was by far the most enjoyable of the evening. There was no real start to the piece as one dancer was grooving alone as we returned from intermission and the lights remained up as the curtain rose and more dancers joined him. All dressed in suits and bowler hats, they gave the time out signal, the curtain went back down, and hard rock music began. When the curtain went up again, the dancers were seated on chairs in a semicircle. Waves of energy pulsed from one side of the semicircle to the other as they arched back and threw their hats off one at a time, the dancer at the end falling down onto the stage. This pulse of energy was repeated many times as the dancer chanted along with the base-heavy music, creating an exhilarating tone. After throwing their jackets, pants, and shoes into the centre of the circle, the piece shifted and six male dancers stood at the front of the stage, there was a beautiful duet, and then the piece shifted back to all the dancers in suits as they came into the audience to choose dance partners. An onstage dance party ensued and their energy was infectious.